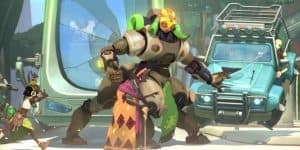 Overwatch's Orisa Nerfed Before Full Release | Nerd Much? Barely a week of existence in PTR, and Overwatch‘s new hero, Orisa, is already being nerfed. Apparently, the developers thought she was far too good of a tank, reducing the magazine size of her Fusion Driver down from 200 to 150, and the cost of her Supercharger ultimate ability is increased by 15%. Unfair as it may seem, don’t get your Joy-cons in a twist yet, this is why the PTR exists in the first place. It’s a place the developers can tweak the game to their heart’s content before committing to any changes and releasing them to the public. Orisa’s changes might not even stick in the end. Stealth: Sound effects and VO distance for entering and exiting Stealth reduced to 15 meters. What do you think of these changes? Will they make the game balance worse or better? Is the Overwatch team going about this all the wrong way? Let us know your thoughts in the comments below!